Every attempt was made to provide correct information and labelling, however any liability for eventual errors or incompleteness is rejected! 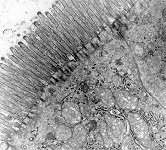 Microvilli (Terminologia anatomica: Mikrovilli) are small finger-like protrusions of the cell membrane that are not actively motile. 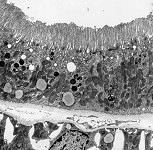 Usually microvilli are closely stretching parallel to each other in so called brush seams of resorbing epithelial cells. 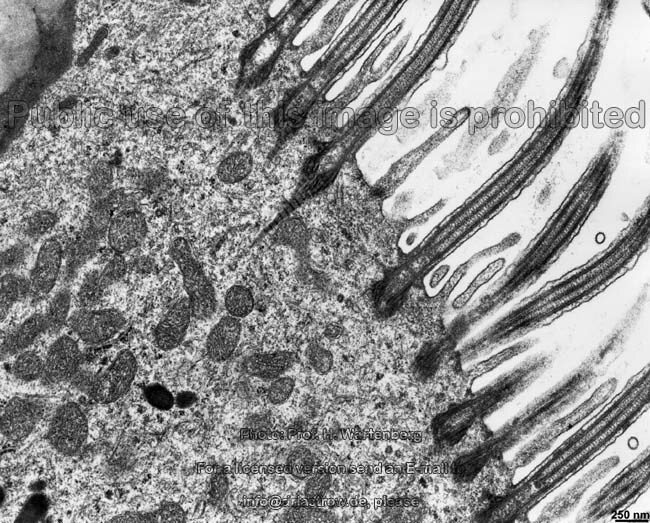 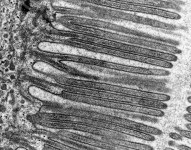 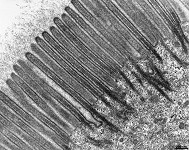 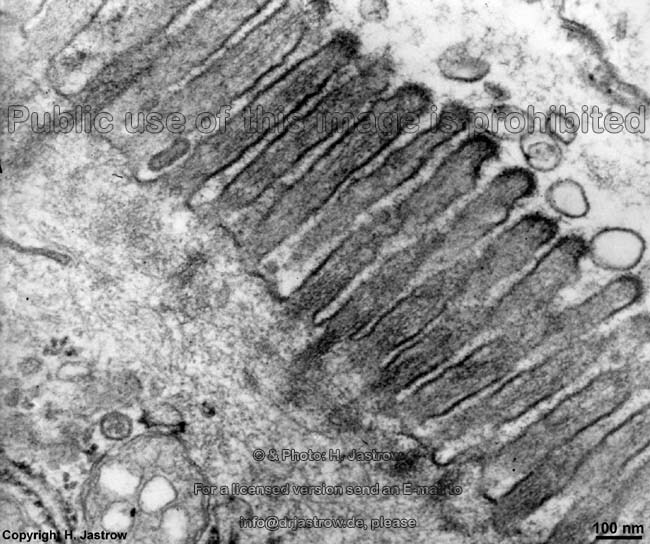 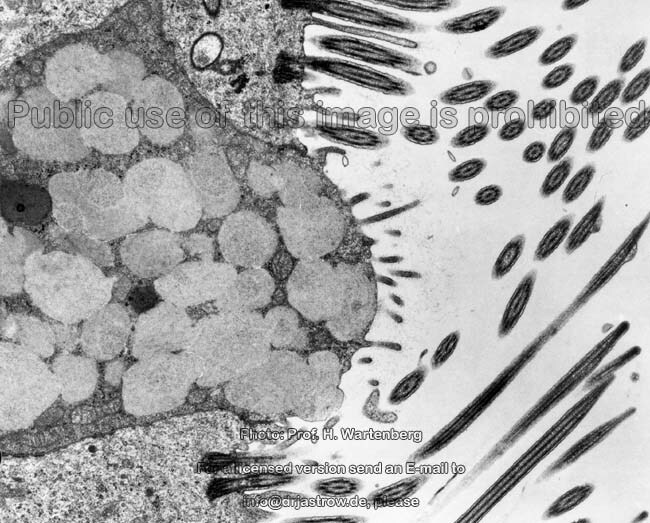 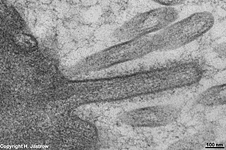 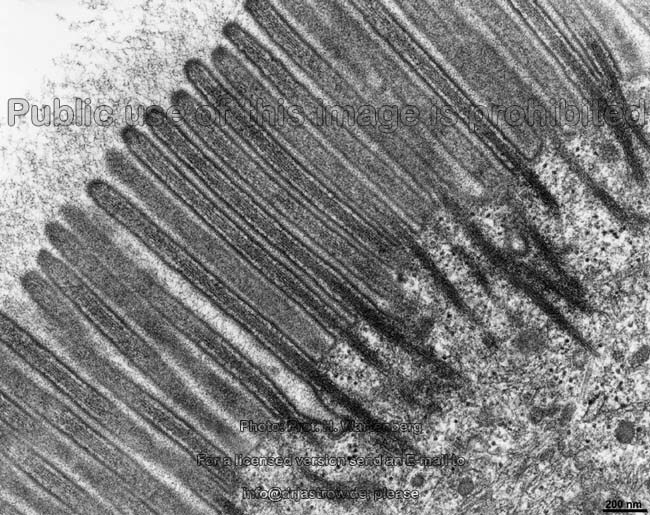 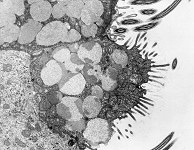 Bundles of actin filaments embedded in cytoplasm are seen in the centres of microvilli. 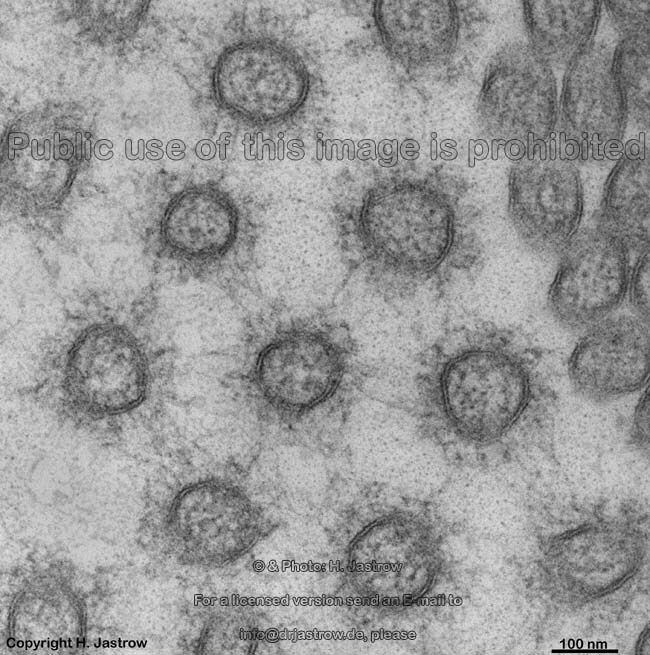 They are basally connected to the terminal web. 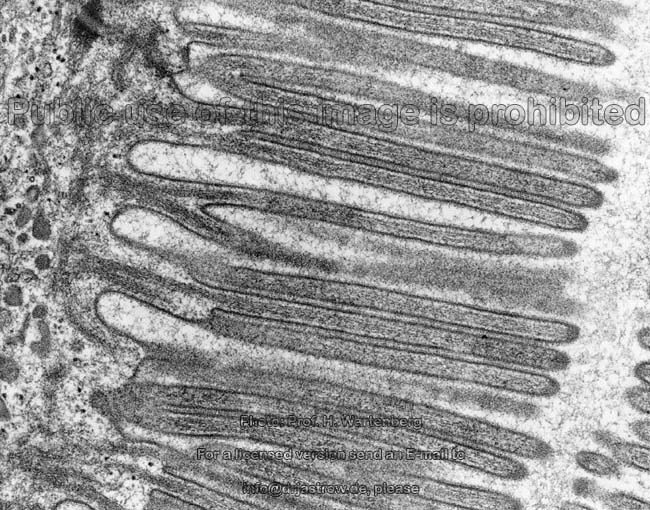 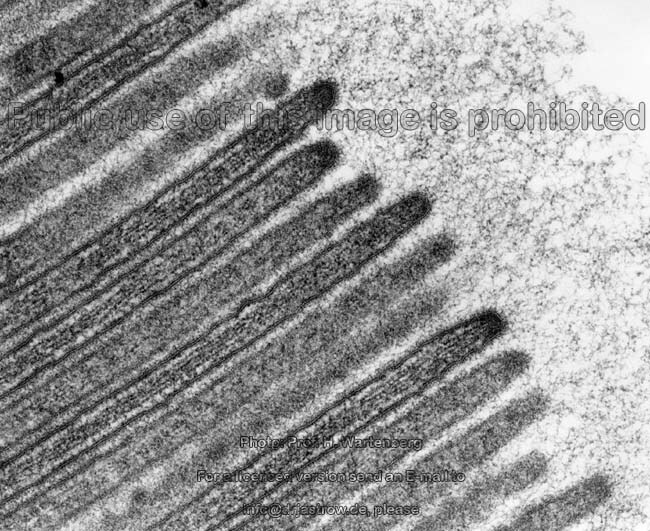 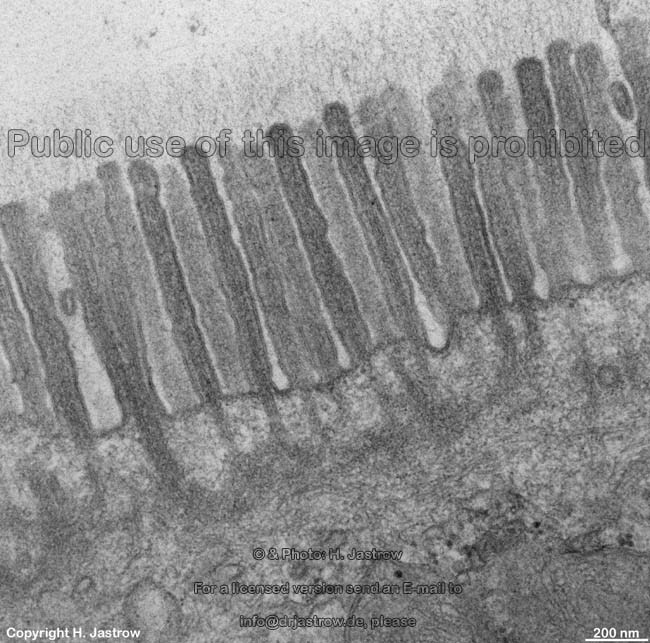 Apically the filaments are attached to the thickened cell membrane on top of the microvilli. 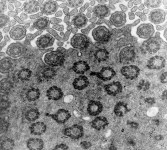 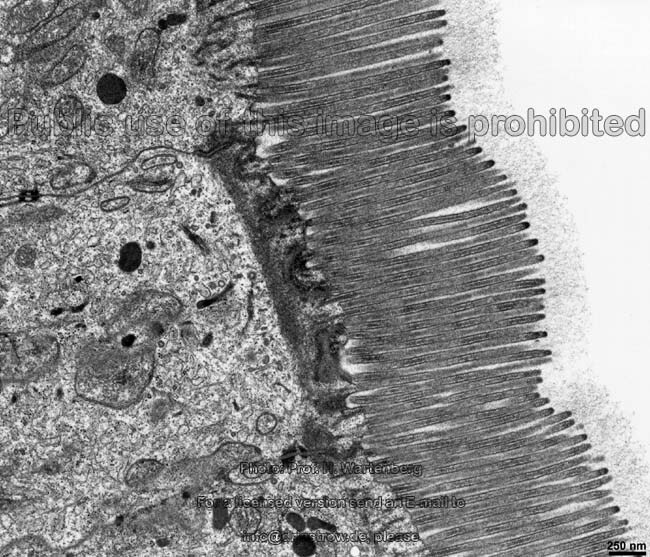 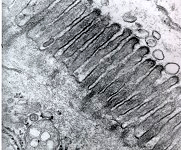 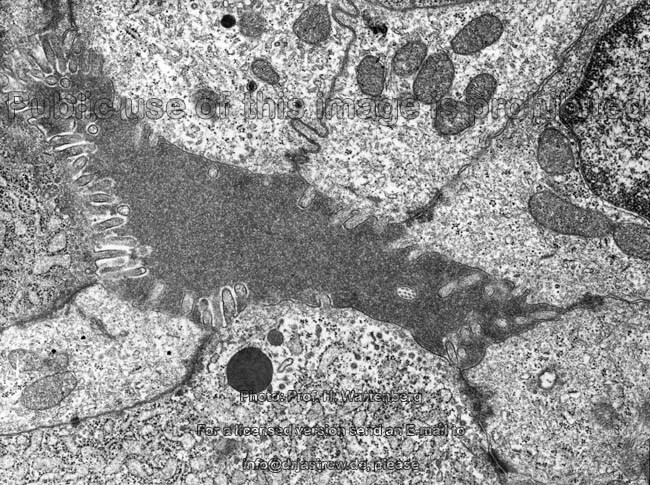 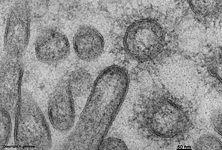 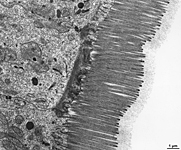 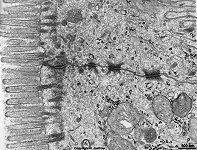 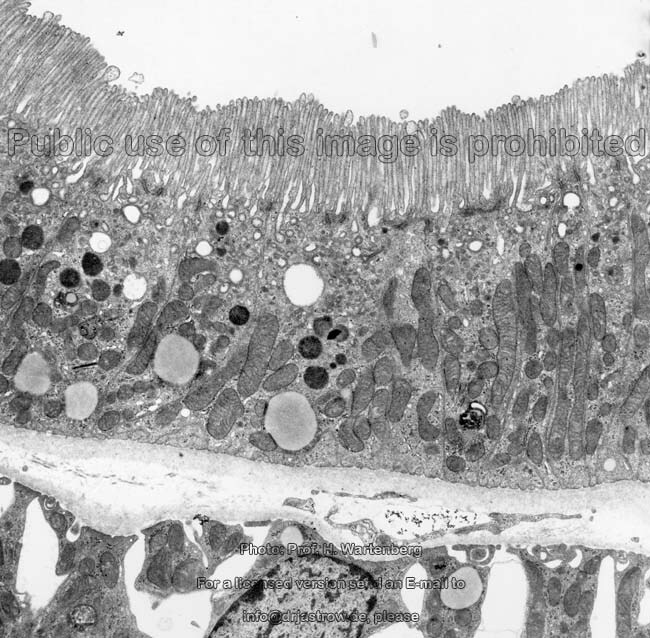 Lots of different proteins often connected to enzymes are located in the outer cell membrane of microvilli of the epithelial cells of the gut. 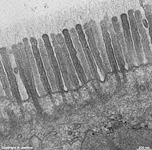 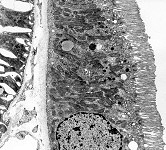 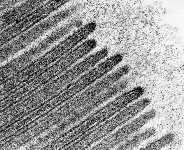 Microvilli strongly increase the cell surface area and thus raise resorption significantly (about 300 times). 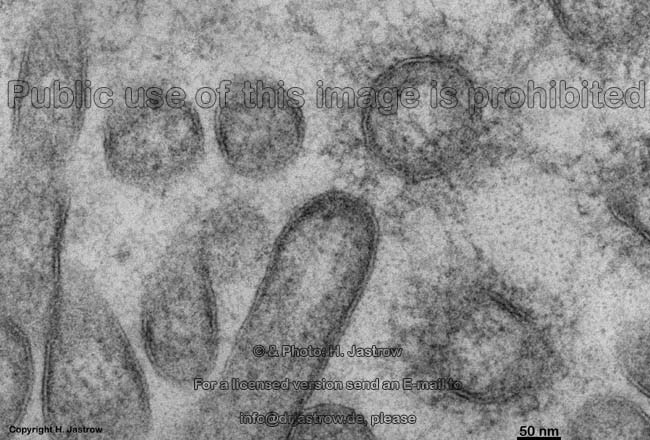 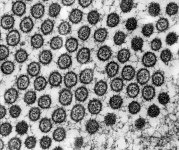 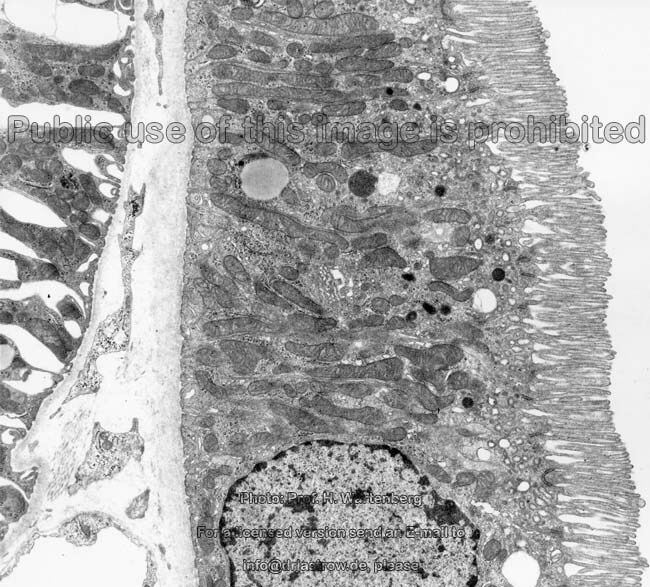 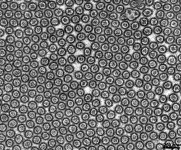 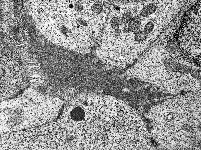 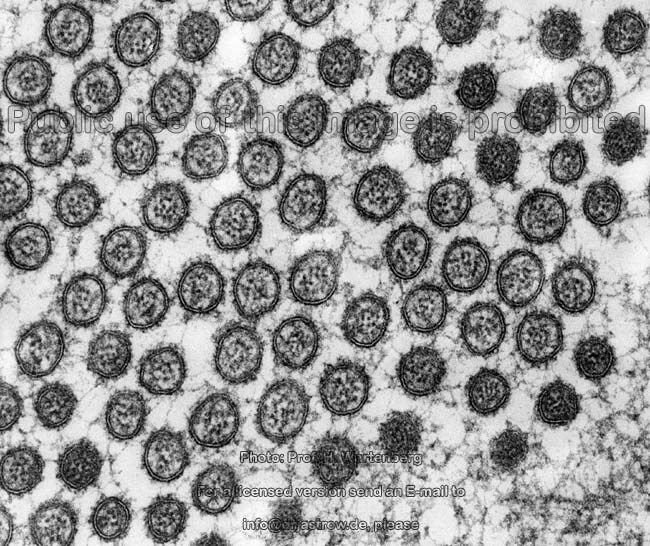 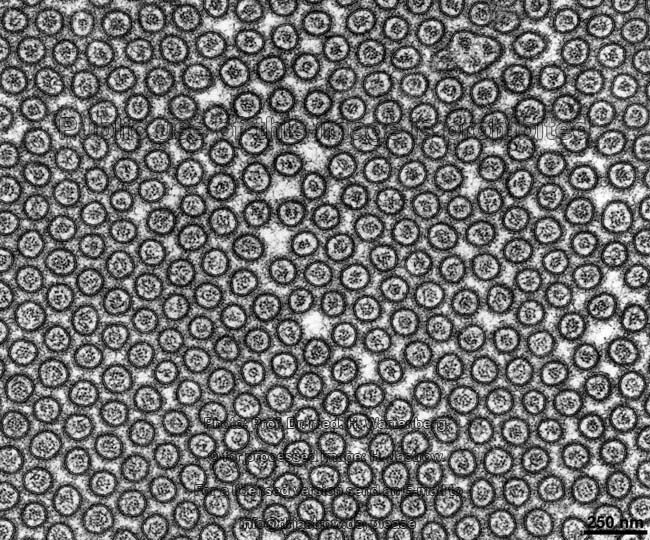 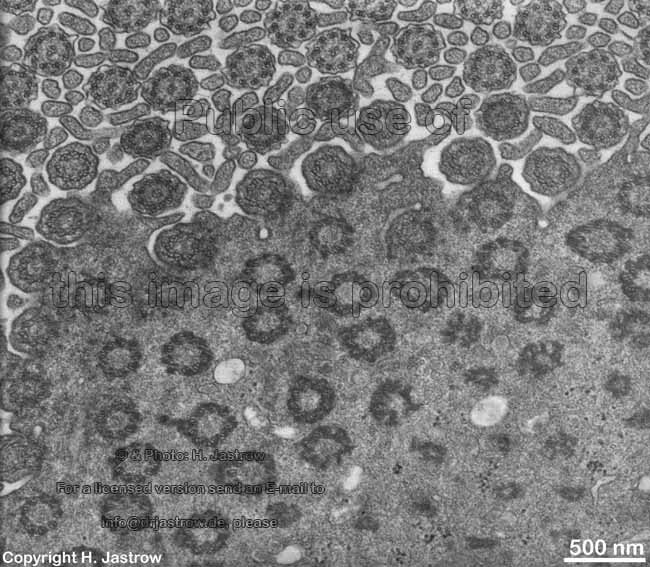 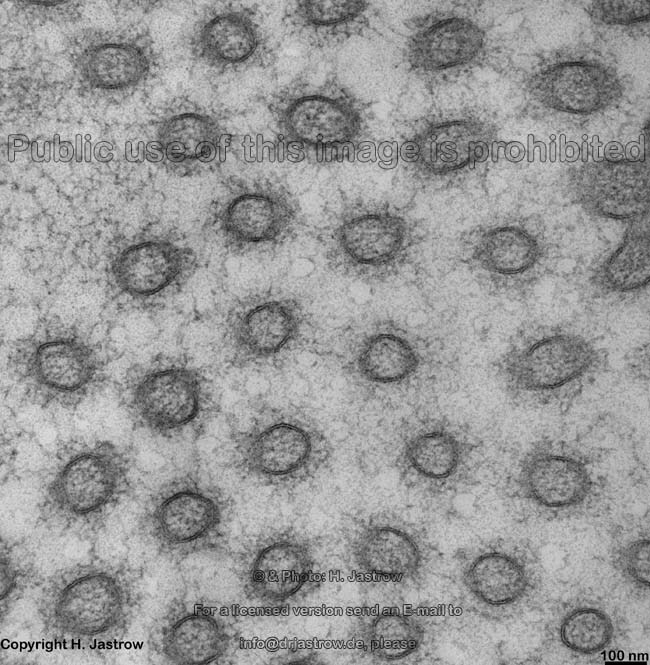 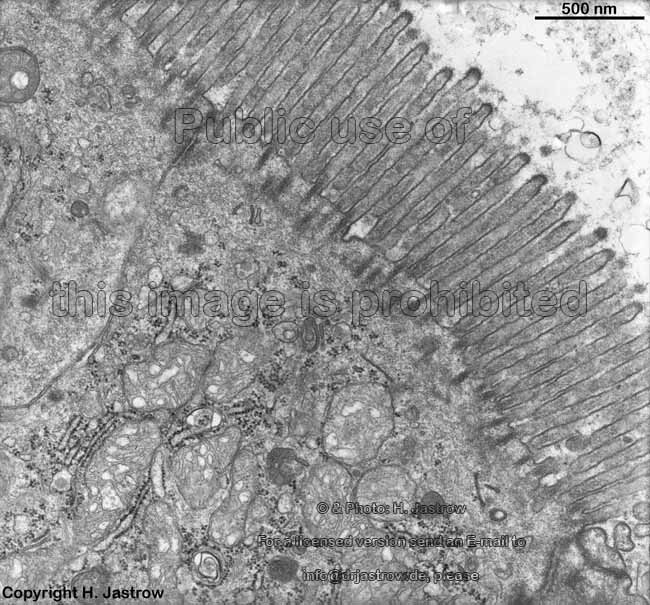 The diameter of a microvillus is about 50 - 100 nm and its length is 1 - 2 µm in brush seams of intestinal cells, however in other epithelial cells length is about 100 - 200 nm and diameter ~ 50 nm. 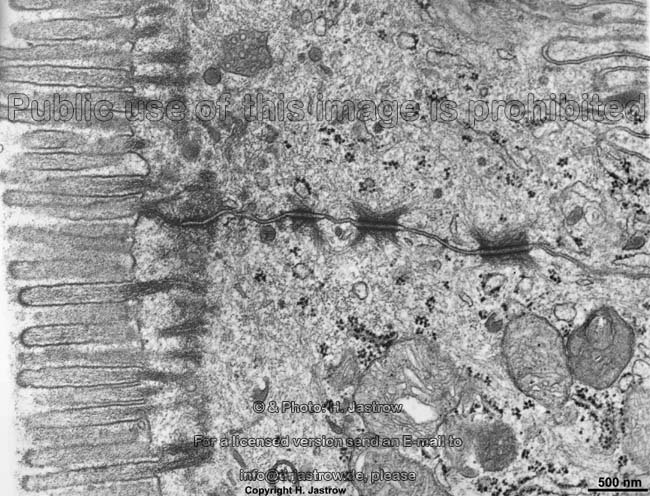 In the gut the apex of a microvillus anchors small filaments, the antennulae microvillares. 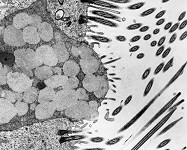 The latter form the glykokalyx. Some images were kindly provided by Prof. H. Wartenberg; other images, page & copyright H. Jastrow.